DF Touch of Mojo, “Joey,” came to us in March of last year. 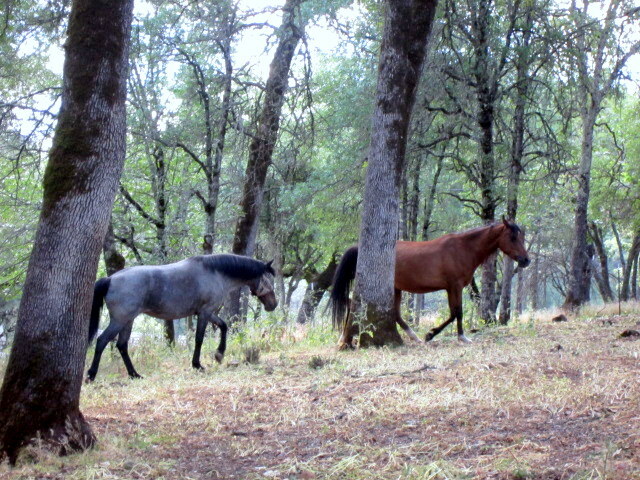 He had been living in a herd setting and not getting quite enough groceries, and hadn’t seen the world beyond his birth place or been handled very much.
. Over last summer he became fat and glossy, and learned about bits and saddles and maybepossiblysomeday–trusting humans! 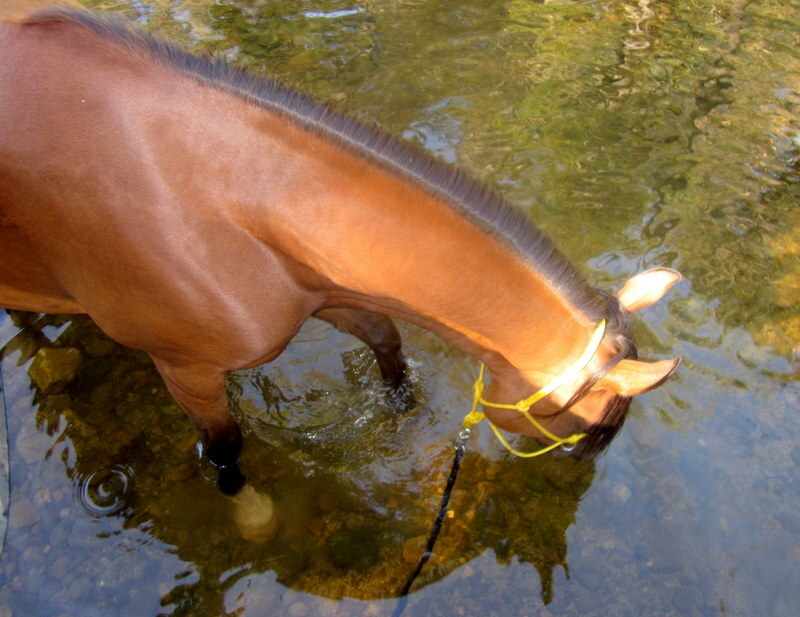 I ponied him out on the trail with faithful ole Blaze, and Joey loved the sights and smells–and water! I had some personal drama end of last year and the first few months of this year, and I had to come to that sad decision to pare down my herd. 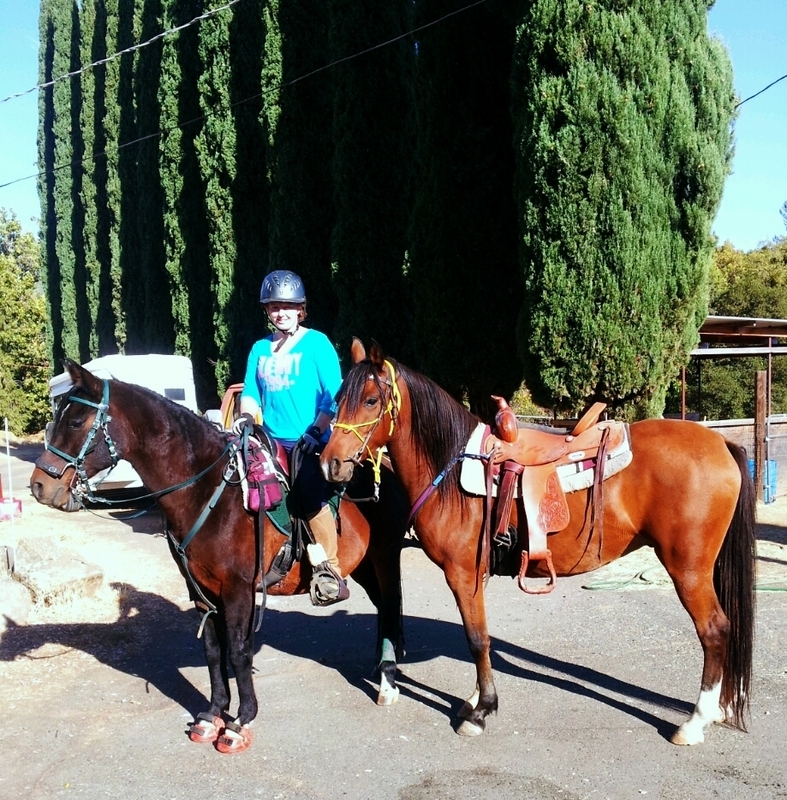 I had never known what my exact intent with Joey was, beyond getting him fat and healthy and on his way to being the great little horse I knew he could be. I started searching for a home for Joey, but it was a long process, with lots of “tire kicking” and enthusiastic phone calls and emails that rapidly petered out when it came down to making any real decisions. A few nice folks actually came and checked him out, but he wasn’t the right match for them. Things began to settle down for me in the last couple of months and in my mind I had pretty well stopped looking for a new home for Joey. 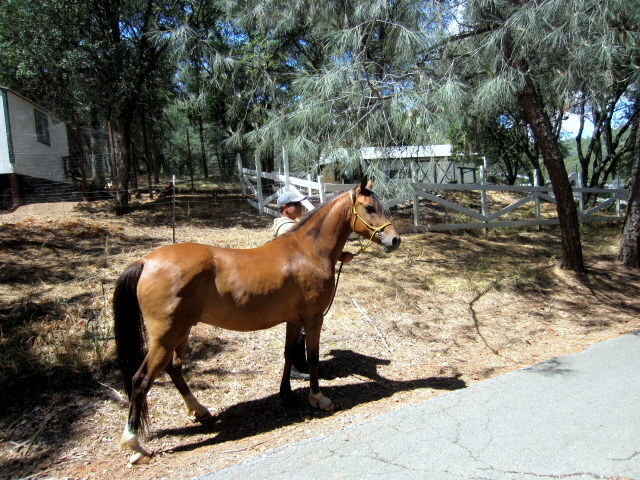 There was still one ad for him left posted, and a nice lady, N, called a few weeks ago, very interested in him. I was skeptical as usual but N and I had a few extended phone calls chatting about Joey, horses, and Arabians in particular. 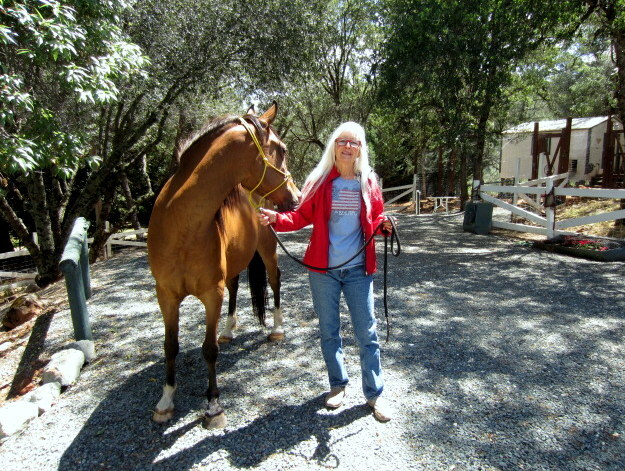 She understood the Arabian brain, loved it, and was ready for another companion for her mare, after losing her 32 year old Arab gelding 6 months past. 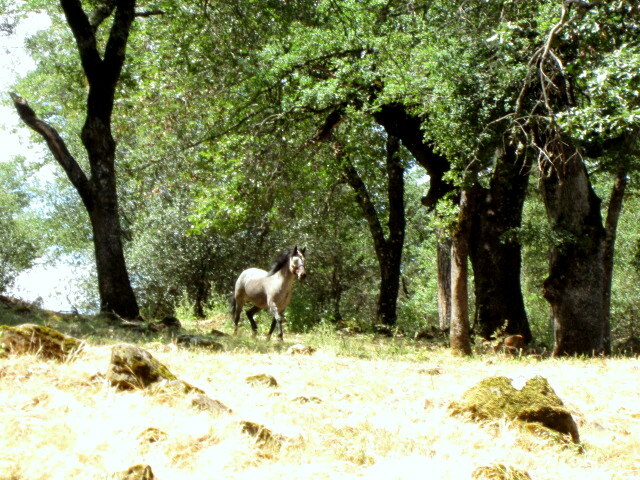 I could tell she was not only an Arab fan, but an incredibly conscientious horse owner, which was only confirmed after meeting her at her home. I decided to take a chance, so my husband J and I dropped Joey off to N yesterday. 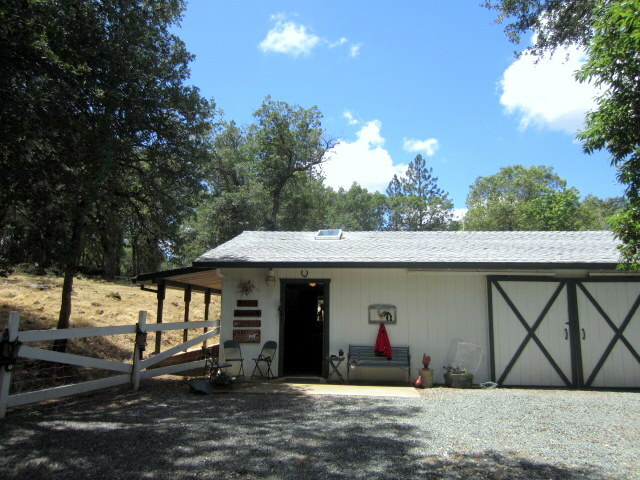 She has a beautiful little barn and acreage in the shady foothills of Grass Valley. 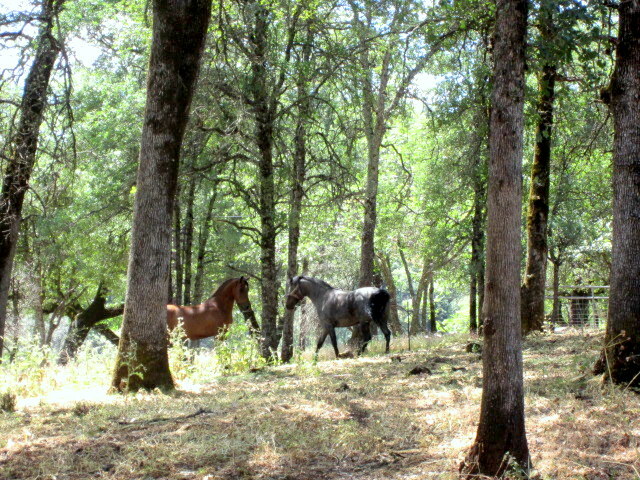 N was thrilled to have him home and we put him right out to meet his new pasture mate. 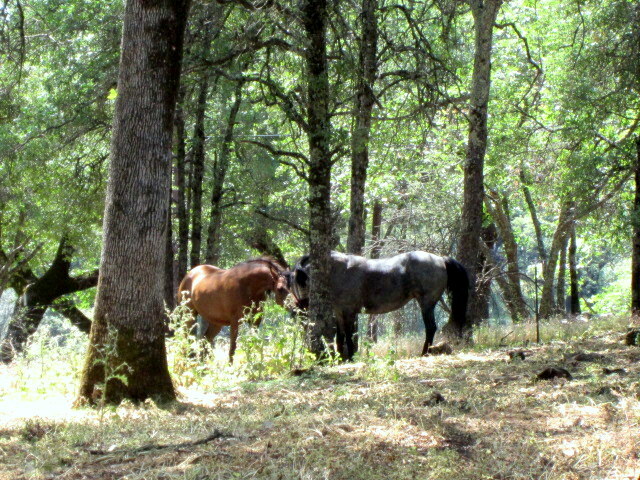 Joey’s new pasture mate is a gorgeous blue roan half Mustang mare who threw one good left hook at Joey before they headed off up the hillside together to graze busily and ignore humans. hmm, let’s see if we can be friends..
Re-homing a horse is bittersweet, no doubt. 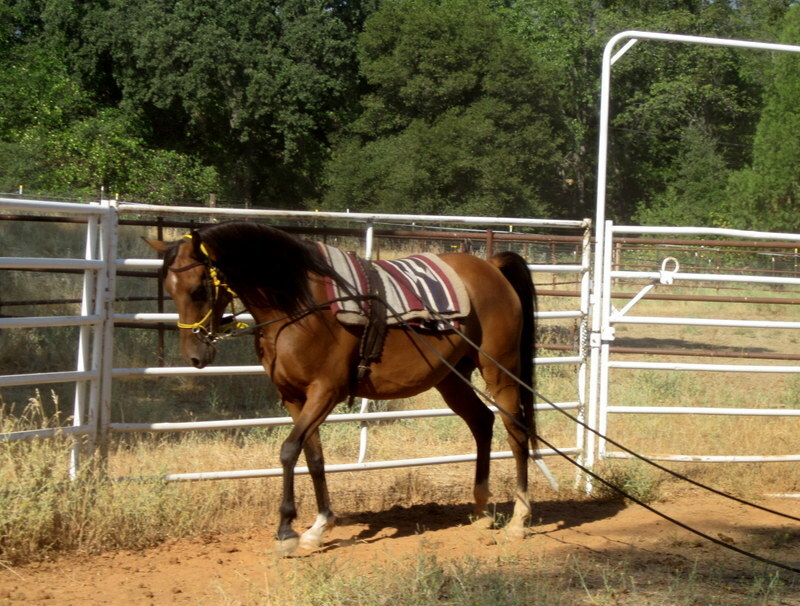 Joey taught me quite a bit in the last year, including some of my own limitations! He and I never quite clicked personality wise but he is a smart, sweet, gorgeous boy and deserves a golden future. I am happy for Joey and N, and excited for their future together. N and I exchanged all our contact information and will be keeping in touch. I am so happy you know where he is, and you can keep updated on his progress (which means we keep updated on his progress). He sure is a gorgeous dude! 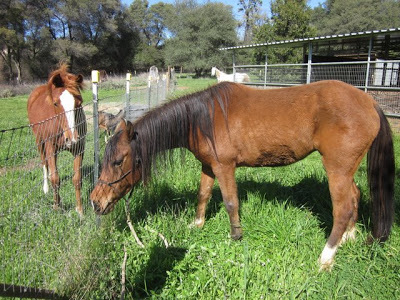 Sadness… but it looks like a lovely home and a beautiful pasture mate. It does look like a good home and I'm glad you took the time to find him something like that rather than letting him go to the first person who was interested. How hard! Even if it is the right thing. You really did a great job turning him around, improving his trust (and his looks, boy is he handsome). He looks happy in his new space. I hope I'll meet him on the trail someday.